Droplets.. are known by many names in many places viz. Dynamo Servlet Beans, ATG Servlet Beans, ATG Custom Servlets, Dynamo Servlet etc. etc... they all refer to our very own "Droplet". A droplet is basically ATG's custom servlet which has some atg-specific customization. Just like we use HttpServlet in J2EE, we have have DynamoServlet class which implements javax.servlet.Servlet interface in ATG. (Of course there are many layers of implementation between Servlet and DynamoServlet). Therefore, to create a droplet, we extend "DynamoServlet" class, and override its "service()" method to run our custom code. Now, let us move on to create our very own "Hello World" droplet !! How to create a droplet? Since we are familiar with extending out of the box component, creation of droplet would be a piece of cake. 2. 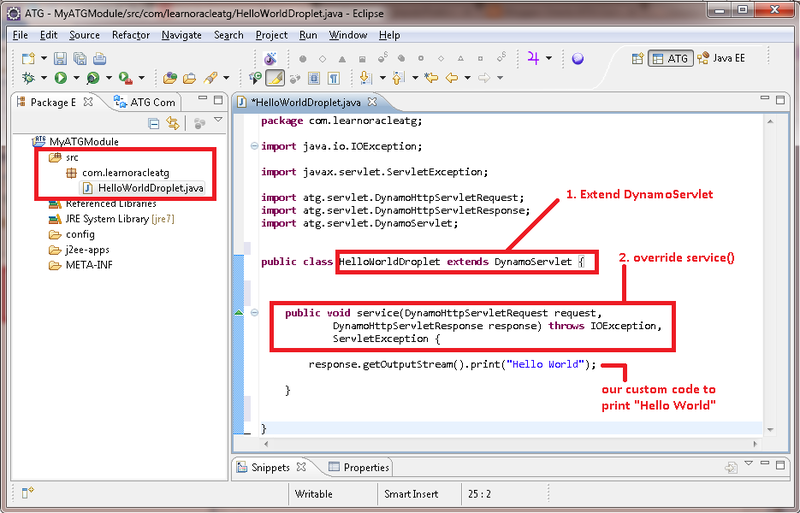 Override "service()" method and write your code. This method is a starting point for your droplet, when it is invoked. 3. Create a configuration file, and set the $class nucleus property to point to your custom class created in Step#1. How to invoke a droplet? 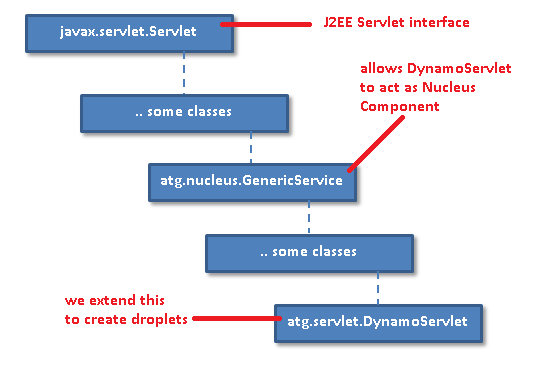 Just like servlets in J2EE, Droplets are generally invoked from JSPs. Whenever, we are writing JSPs, we make sure that we do not add any "logic" in JSPs. If we want some of the content to be dynamically displayed using a logic, we use a droplet! Let us create a JSP, and use it to invoke a droplet. 2. Add the <%@ taglib uri="/dspTaglib" prefix="dsp" %> on top of the jsp. This is to make your JSP aware of ATG's very own custom "dsp" tag library. Now that we know how a droplet is created and how we can invoke it, we can easily display dynamic content on our web-application! Let us move on and understand droplets in more detail..
can you please share your email id ? You can post your questions here and i'll be glad to answer them. Hi Monis, I tried the same steps as given here to create a droplet. The output of my JSP is in plain text and not HTML. Infact the HTML tags also show up in the browser. in your droplet. This will render HTML on your page instead of plain-text. And the same thing happens with my form handler? Any thoughts? The basic component-class structure is same, but a formhandler is different in many ways. 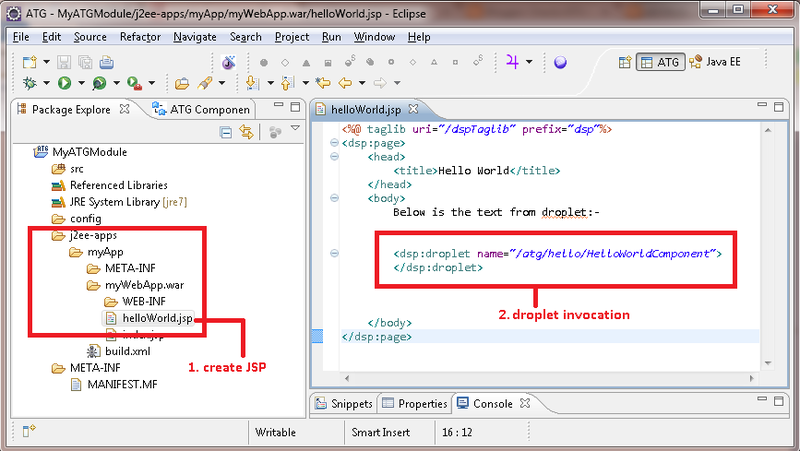 javax.servlet.jsp.JspException: CANT_FIND_DROPLET: Unable to find the droplet with name "/atg/hello/HelloWorldComponent". I have done same as above. Can you help y this is happening. This means that your component is not getting resolved. A droplet is a special type of component. The class you use in a droplet's component must extend DynamoHttpServlet. In a normal component (non-droplet), you can have any class. can you please explain the difference between droplet and component. a Droplet is a special type of component which extends DynamoServlet and is generally used for display logic. Do we need to map the droplet in web.xml?